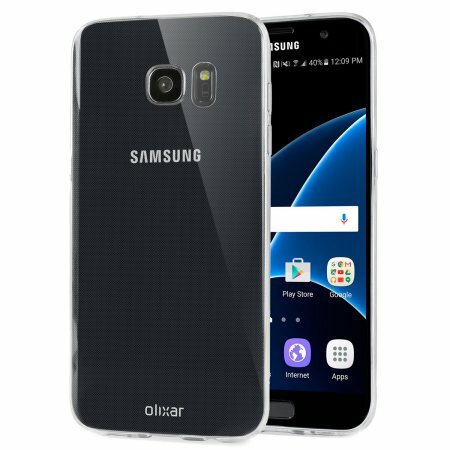 Custom moulded for the Samsung Galaxy S7, this 100% clear Ultra-Thin case by Olixar provides slim fitting and durable protection against damage while adding next to nothing in size and weight. The product itself looks and fits well. It adds just enough grip to the back of the phone to make me confident holding it, and enough protection that I'm not hesitant to put it down on most surfaces. There will be some drop protection, but that's not my primary concern. I wanted a minimalist case that added tactility and protection while keeping the phone slim in my pocket. This case does exactly that. I used this for 1 day. Material used is not sturdy enough and the cover can be dislodged when putting your phone into a pocket. Went to the Samsung shop and bought another one that works and cost less. This case protects phone very well. However, I bought it as I wanted to give my phone refreshed look and expose its beautiful design. I definitely recommend it. The item is fit for purpose and is a great accessory for the phone. It protects the phone whilst maintaining the appearance of the phone. Perfect for S7 (non edge). Case is well fitting and raised around the camera and screen edge to protect the glass when laid down. Case is grippy so not slippery which is reassuring. Have also recommended to family members with their new phones and they're happy too! This case is the best thin case I have ever bought and dreamed about! It makes me feel that I'm actually holding a 700 dollar phone! Best investment ever! High quality products that are true to the description on the web site. Took awhile to get to me but I am very happy with the end product. Quick delivery which i was happy with. Very good prices also. Simple, well fitted, well made. Basic s7 case that does the job. No complaints whatsoever. I wanted something that was very thin and clear, but gives some protection from being dropped. I also wanted something that made the phone easier to pickup of the desk (grippy). This filled the bill and impressed my 2 team mates with S7s to buy the same item. This is a well built solid silicone gel case. It is sturdy and handles well. No flimsiness experienced at the edges on usual use (as claimed in some reviews). This will render your S7 so much safer in terms of handling without slipping from your hands. It is also barely visible this retaining the beauty of this device. I would order it again if needed. This is a nice-looking soft plastic cover for the S7 which is virtually invisible, so lets you see your phone's sides and back nicely. I do like this, but as the cover is so thin, I'm not convinced it really protects the phone should you drop or knock it, so I've gone back to using the original Samsung flip cover to be on the safe side. This is a cost effective good looking protection that doesn't change much the apearance of the phone. You'll probably need to buy 2 a year to maintain a good look since, the cover is soft and it seems it will stretch over time. It took a while to get it, so order when you are not in a hurry. The other positive reviews helped convince me. A really "clearview" experience (remember Supercar?). Samsung produce this beautiful phone, which without this tactile case just seems to all too easily slip out of the hand or pocket. But this "barely there" case works a treat, easy to remove fit as required. With my usual customised velcro on the back so it easily holds to the car dashboard, and the owner's (peelable) name label stuck on the back of the phone itself - clearly visible through the back of the case, it really reaches the spot. Job done. This is a great accessory for my new Samsung Galaxy S7, it fits brilliantly, keeps it clean and safe yet still shows the beautiful gold colour of the device. Great prices, wide product choice and speedy service from Mobile Fun, plus helpful customer reviews make it a no-brainier for me. Thanks Mobile Fun! Hubby was that impressed he wanted one for his new Samsung s7 it fits this as perfectly as the Moyo 4g does. Fantastic case worthy of being charged twice this price. Do not hesitate in buying this case from mobile fun. Very impressed for the price. Very slim but protective. Shows off the phone (you dont notice it has a case) and very comfortable. Quality product long delivery time. Have bought this for the moto g4plus and again for new samsung s 7. Great fit very very light. Almost impossible to feel it on. Stops phone sliding around on surfaces. Had otterbox on previous phones and whilst those were fantastic were bulky and too expensive. OLIXAR ULTRA THIN ALL THE WAY !! Very good, but a little flimsy around the edges. I was expecting it to be a bit more robust. Wanted a minimalist cover just for scratch protection. This is perfect. Enough of a lip to keep the screen off the table when face down. Good grip texture. And very little bulk added. Just as I thought, the case is very slim and adds almost nothing to my S7. Love it! As light weight as you need. Soft, gives good grip and protection. I purchased this case to protect the new S7 I had on order. The case is almost invisible and shows off the shiny new Samsung Smartphone, I am very pleased. Unfortunately the mobile phone I have read so much about that is rated number one device by Which magazine and most reviewers. Well that was rubbish at holding onto a signal whilst driving and working. A complete waste of money. So the phone has been returned, and it's back to my reliable Nokia Lumia 930. As for the case. Redundancy. This case doesn't make the phone more bulky in the pocket, yet protects the sides, edges and buttons well. Good fit. AND It's HALF the price of the bulkier cases at the phone store. This is the best case I've had for my S7. It's super thin and lets the beauty of the phone shine. I hardly notice that I have a case on at all. Case is great like described. Very fast delivery. Highly recommended site! The cover arrived quickly and my S7 fits snugly. It adds very little to the size of the phone and is comfortable to hold. I am very pleased with this purchase. This item is perfect fit my Galaxy S7 giving it a clean look and still keep it's original design. Will buy another one for my back up. Thanks. Quick delivery which was very important for my new naked mobile. Clear so the beautiful rose gold colour shows through. Snug fit to keep my mobile super safe. Excellent price to protect my poor bank balance. This definitely covers all the bases and I am very pleased with the purchase. Delivers on promise of what was advertised, a transparent case. Recommended for those who value how their phone looks and do not want to cover it with too extravagant a case. Offers good protection if you generally don't mistreat your phone that much. It is very prone to fingerprints, especially visible at the back of the case. The well fitted design however more than makes up for that by making the phone just the right size and weight to handle beautifully. I would recommend taking it off every couple of weeks to a month to clean it because it tends to collect dust on the inside. I have a Samsung Galaxy S7. The cover is so soft that when you pick up the phone, the cover moves away along the long edges. It almost feels as if it will peel off the phone. It's very fingerprint resistant. The buttons on the sides are covered and I find it difficult to use them. The holes for the connections at the bottom, speakers, camera and sensor at the back, are all well placed and the correct size. Fits perfectly onto my S7 even though it is slightly thicker thanks to a dbrand skin. Now I can show off the skin without worrying about the phone slipping out of my hands, or my pocket when sitting down! Protects the screen too. Buttons are a fraction harder to feel and press but still entirely usable. Super fast shipping from UK to Sydney; ordered Thursday and received the following Tuesday (3 business days). This phone case is brilliant, ultra thin as advertised, total protection for my new prized possession Galaxy S7, and I can still see and show off my beautiful phone in all its glory with the case being clear and see through, also it hardly adds any extra size to the device. A must for any smartphone owner!!!!! Great phone cover. Very sleek. Adds much needed grip to the device. I wanted a thin, easy to hold and protective case for my Galaxy s7. This was just right. The best products and fast shipping to Croatia. Great cover for my S7 and very fast delivery even here in Italy. Only four star because it's a little too soft on the edges of the screen sadly, but still very good.